With hindsight, the signs have been there since the end of summer 2017, after the Kindle Scout/Press team changed. Megan, who everyone liked, was promoted to Montlake, Amazon's romance imprint. The new team encouraged NaNoWriMo authors to submit their books to Kindle Scout, which struck me as quite odd - they wanted books that had been written in four weeks, only a month afterwards so with minimal revision? Then they offered critiques to the top non-selected books. I didn't understand this. Why spend time and money on books you are not going to publish? They have announced that Kindle Press is no longer interested in sequels, just the first book in a series or a standalone.Though some books still get good promotions such as Bookbubs, this seems to happen less frequently. Instead books are getting price drops without accompanying promotion.Kindle Press will no longer update the back matter to include links to later books in a series, even though when a reader has finished Book 1, that is the very point at which she needs a link to Book 2. 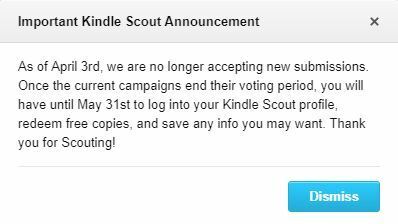 And of course, new authors won't be offered contracts through Kindle Scout.So what happens now to Kindle Press authors? I love Kindle Press. I've sold over 10,000 copies of my first two Time Rats novels because they were KP books. I wear my KP tee shirt with pride. But nothing lasts forever, and everything changes.